I’m not one to usually watch talent competition shows, mostly because there are just too many of them and are usually lacking in quality. I actually detest America’s Got Talent. I think it mostly comes down to the overwhelming presence of underwhelming “acts” – No, I do not need to see you play a harmonica with your nose! – and of course the judges’ panel. I can’t stand Piers Morgan. I know I’m in the land of the Brits, but something about that guy rubs me the wrong way. And don’t get me started on David Hasselhoff, Howie Mandel, and Nick Cannon. I can deal with Sharon Osbourne, but in that setting she becomes this shrill presence in the midst of idiots. Basically, you have people with questionable talents judging others with questionable talents. My favorite talent competition show remains So You Think You Can Dance, firstly because I come from a dancing background, but also because the contestants are increasingly more impressive and the judges are experts in their fields and the affable Cat Deeley is a pleasure to watch (and so is her great sense of style). I’ve seen my share of American Idol through the years, and was able to simultaneously catch glimpses of the US and UK renditions of The X Factor, but that show becomes nauseating with its over-the-top commercialization of some really talented singers, who then get pushed aside by petty attempts of the has-been judges to steal their spotlight. Yet the other day I caught the first episode of the new season of Britain’s Got Talent and had quite a different reaction watching it compared to the US version. It’s still schmaltzy and predictable, but TV ads have been constantly promoting “The Return of Simon Cowell.” I wasn’t aware that he went anywhere. He’s maybe been in the US for like, what, a year? Oh the Brits, always hyping things up (I see a tabloid culture seeping through!). That said, I must admit that I really like Simon Cowell. Don’t you remember when the first season of American Idol aired and everyone was saying, Who is this guy? He’s terrible AND hilarious AND so right! You hated yourself for loving him so much. After all the years of him running these talent shows and turning them into global franchises, he doesn’t appear to have changed that much. I’m sure he thinks he’s more important than he really is, and maybe recently has been less harsh in his criticism, but he still possesses a balance of likeability and repugnance – the perfect combination for a successful TV personality. There are two female judges who I’ve never seen before, but all I could glean from the episode was that one is a famous ballroom dancer and the other…I have no idea. Most likely a member of a 90s British pop group. But I found the addition of new judge David Walliams to be a very interesting, albeit refreshing choice. You may know Walliams from Little Britain, a peculiar sketch comedy with Matt Lucas. In the last decade he has procured from what I can tell an esteemed place in Britain’s popular culture scene. From the first episode, Walliams played on the public sentiments towards Cowell, poking fun at Cowell’s celebrity and idolizing him in the process, treating him like royalty with appropriate pomp and circumstance. But during the live auditions, you can see that there is a bromance abrewin’. One that is light-hearted and quite genuine and not played up for the cameras. This comes down to Walliams’ humble demeanor and his gift for wit and charm, while still being honest and rejecting contestants. Meanwhile, Cowell reacts in amazement and envy, not only admiring Walliams’ handsome constitution but his grace and bravado at rejecting and accepting those that audition. I look forward to seeing where this goes – I think this is the beginning of a beautiful friendship. You can watch the emerging bromance and comedy duo below on The Jonathon Ross Show. 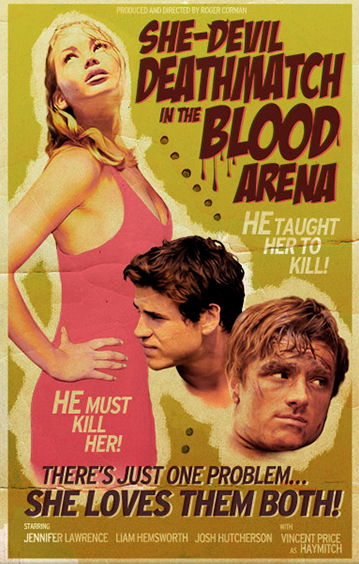 I am loving this fake Hunger Games poster, courtesy of Entertainment Weekly, who decided to have some fun in imagining how the film would be interpreted if handled by different directors. This one envisioned with Roger Corman (Little Shop of Horrors, and other B horror films) at the helm. See all sixteen of them here. Having read the series over a year ago now, I’m relishing re-reading the first novel this week in a last-minute effort to remind myself of the intricacies of this riveting story. Hopefully I’ll be back next week with a review of the film, if only those teensters don’t sell out every showing over the weekend. Ahh the power of the 12-19 year old demographic! To put it bluntly, I share Louis C.K.’s sentiments about wanting to be, um, “involved” with Ewan McGregor. I first took notice of Ewan in The Phantom Menace of course, but the real infatuation began with Moulin Rouge – how can you not fall in love with that charming smile and that voice? – as I’m sure was the same for most teenage girls upon seeing that film. From there it seemed as if every weekend in high school was spent discovering more of Ewan’s body of work (Trainspotting, Velvet Goldmine, Black Hawk Down)…and his body. Seriously, that man is naked in so many of his films. But he’s had such great recent work too (The Ghost Writer, Beginners), I think now more than ever he’s in his prime. Plus, he’s so cool he rode a motorcycle around the world. Twice. He is definitely in my top 5 of celebrity crushes that you’re allowed to sleep with if in a committed relationship. Definitely. So I can totally see where Louis C.K. is coming from. I think he’s spot on, in a completely vulgar and kind of creepy way. I was recently just telling a friend about the time when I was in sixth grade and my class went on an awesome overnight field trip to SeaWorld, where we got to have a sleepover in the Shark Encounter exhibit. Yes, be jealous. There was a large room where most of the class slept, sans chaperones or teachers nearby, but before we went to bed the SeaWorld staff said that a few of us could sleep in the glass tunnel of the actual aquarium – meaning just a few inches of glass would separate us from these so-called human killing machines as they lurked all around us in the dark. I was so in. How could you not take such an awesome opportunity? What I didn’t realize at the time was that such a decision meant that I would forgo the first ever (and last) opportunity I would have to play spin the bottle, as all the “cool” kids chose to do while a handful of us actual cool kids slept in a glass tunnel. With sharks. Basically, this moment pretty much encapsulates my entire life, at least my life into my early twenties, of my interaction-with-boys to moments-of-nerdiness (but actually awesomeness) ratio. Long story short, it’s this kind of story that makes me think that writer/director/actress/just-all-around-cool-person Mindy Kaling and I could easily be best friends. I finally got around to reading her funny collection of essays in the book Is Everyone Hanging Out Without Me? (And Other Concerns) and I can totally relate. Firstly, the title alone sums up fears that I am so not as cool as I think. Also, I love funny women that are straight-laced and nerdy, and therefore non-druggies, yet you can tell they would be so much fun to hang out with. That is, if you love talking about classic SNL moments (which I do) and awkward childhood memories that never involved sports and boys – because those two things were never your forte – but did incorporate the fact that you went to drama, band, and yearbook camp (that last one does in fact exist). I love Mindy’s unabashed love for romantic comedies, even though she knows how trite they can sometimes be. And I absolutely love that we share the same comedy hero – Conan O’Brien – of whom she has had the good fortune of interning at his Late Night show. 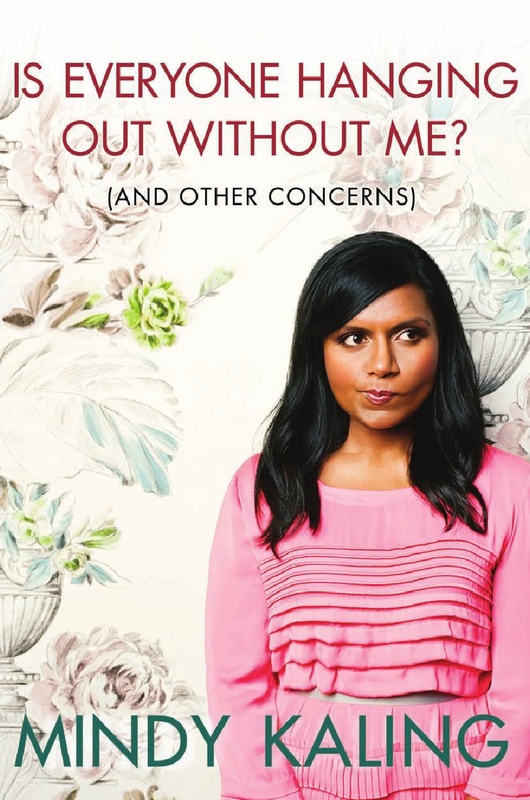 I love a lot of other things about her and the book, but really you should just go read the book for yourself, especially if you’re a fan of The Office and the amazing Kelly Kapoor. Not gonna lie, I kind of love this current take on Cinderella being a drunk. As was pitch-perfectly displayed in the Saturday Night Live sketch, “Disney Housewives”, Kristen Wiig killed as Cinderella. I suppose we can surmise from the sketch that the princess became such a detestable person because she ended up marrying a Prince whose real passion is shoes…and men (and you know you can’t divorce in the Disney Universe). This has clearly taken a toll on her Disney-culturally-constructed pipe dreams of a happily ever after. I don’t feel too sorry for her though, since Cinderella is probably the most one-dimensional princess of them all. I mean, the best part of her story were her singing friends (which were mice, in case you needed reminding) and really the story comes down to narcissism and materialism. No wonder her life fell to shambles – poor girl didn’t even marry for love! But how would she know love considering the social and economic environment she grew up in? Wow, this just got a lot deeper than I realized. Life is a vicious cycle sometimes. Okay, maybe I feel a little sorry for her. Anyway, needless to say, I’ve never been much of a fan – I’ve always been more of a Belle, Ariel, and Pocahontas kind of girl. You know, the curious and compassionate type, with integrity intact, that befriends cute crustaceans, racoons, and the occasional candlestick.